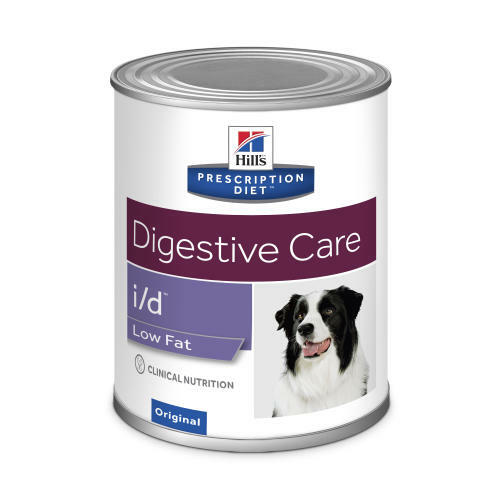 Highly digestible, low fat food that can be fed long term to manage gastrointestinal disorders and minimize risk of recurrence.Clinically proven to help recovery of digestive tract. Prebiotic fibres to promote growth of beneficial bacteria. Includes ginger to help calm and soothe digestive tract. Liver, rice, pork, maize, dried whole egg, flaxseed, dried beet pulp, oat fibre, minerals, digest, vegetable oil, ginger root powder, vitamins, trace elements, taurine, L-carnitine. Beta-carotene 0.4 mg/kg, Calcium 0.0019, Carbohydrate (NFE) 0.152, Fat 0.022, Fibre (crude) 0.006, Ginger 2500 mg/kg, L-Carnitine 104 mg/kg, Magnesium 0.0002, Omega-3 fatty acids 0.0021, Omega-6 fatty acids 0.0068, Phosphorus 0.0014, Potassium 0.0022, Protein 0.066, Sodium 0.001, Taurine 358 mg/kg, Vitamin A 12589 IU/kg, Vitamin C 25 mg/kg, Vitamin D 106 IU/kg, Vitamin E 130 mg/kg.